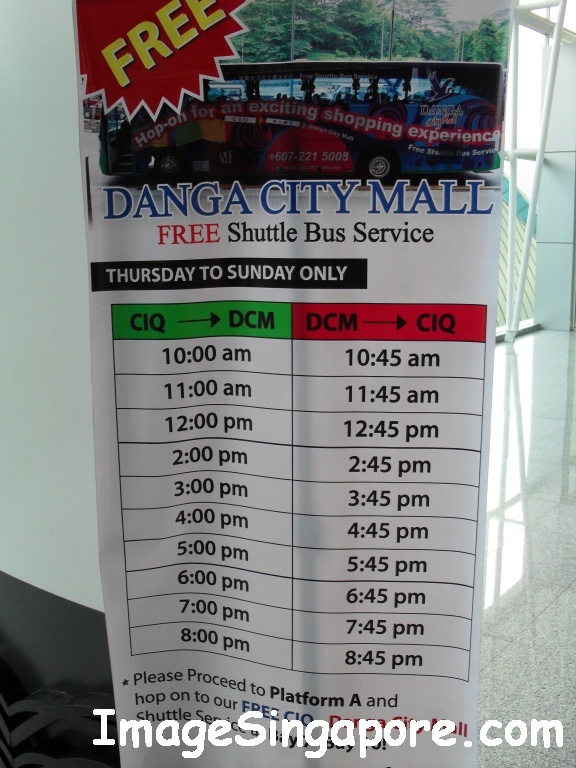 For those of you who wants to visit Danga City Mall in Johor Bahru, there is now a free shuttle bus service that goes from Johor Bahru CIQ ( Customs and Immigration) to Danga City Mall. However this free bus service is only available from Thursday to Sunday at designated time. The good news is that the bus service also provides a free return trip to Johor CIQ from the mall. So now there is no excuse for not visiting Danga City Mall. The photo will highlight all the details of this free bus service. Update Information on 21st July 2011 – This free bus shuttle service had been discontinued. You can take S1 bus service from the bus interchange under the Johor Bahru Customs and Immigration Building. The S1 service is operated by Causeway Link and it travel in a loop. It will go to Pelangi Plaza first, follow by KSL City Mall, Mutiara Hotel and then proceed to Danga City Mall. The final destination would be the Customs and Immigration building. Ask the bus driver for exact fare to be paid and also tell him to inform you when it is time to alight at Danga City Mall.